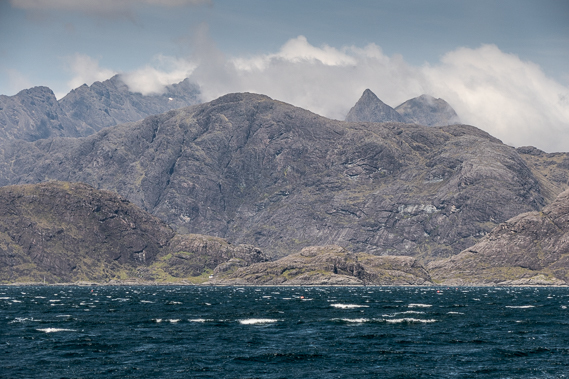 Today was was a long sail; ten hours, with a lunch stop in Loch Scavaig,looking into the heart of the Cuillin. 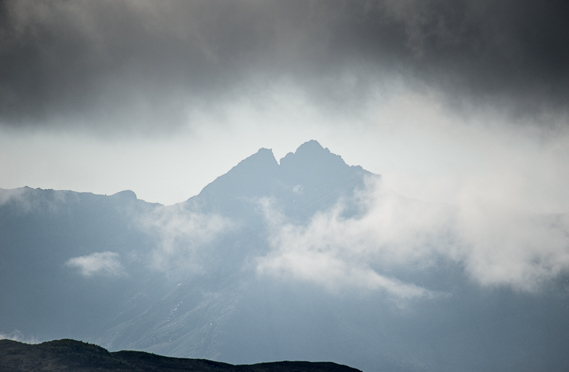 It was the third time I’d been to this part of Skye. Once with mum and dad on a family holiday when I was in my early teens, then with Gwenda before we were married. 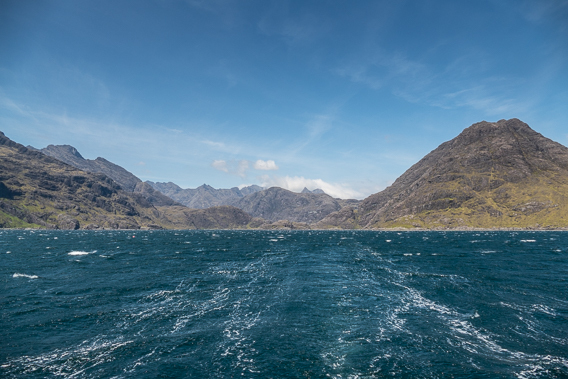 On both occasions we had taken the small boat out of Elgol to Loch Coruisk and were awe struck with the power and sublime beauty of the Cuillin. It was the same this time and there was enough of the tops showing through ever changing clouds to once again experience the full allure of these magnificent mountains. 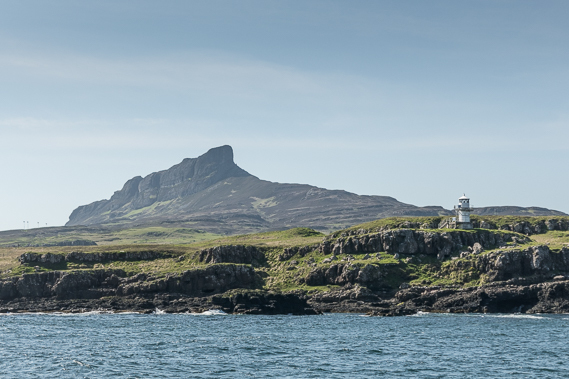 After lunch we sailed south past Rum then hugged the east side of Eigg, another one of the now many islands that were calling to us. 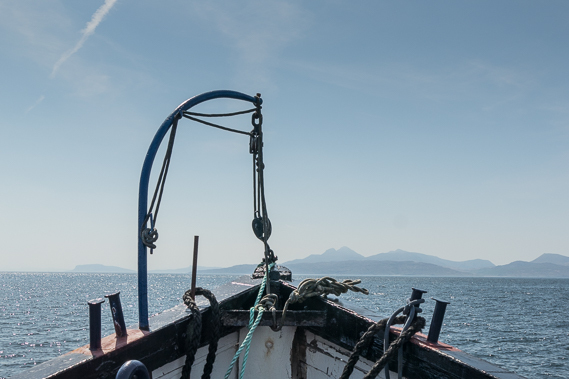 Muck was on our port side as we headed down towards Ardnamurchan Point and into the Sound of Mull. 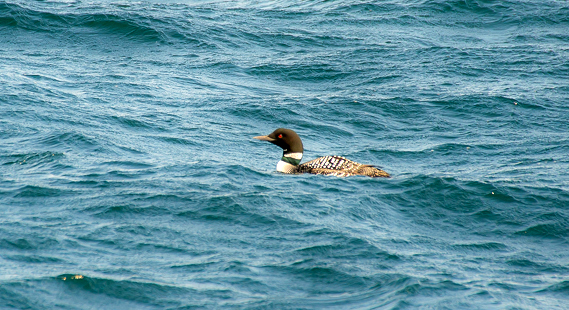 A glorious summer Great-northern Diver gracefully tacked passed us and a White-tailed Eagle was spotted over Bloody Bay, (north of Tobbermory) where a pair have bred for the last few years. 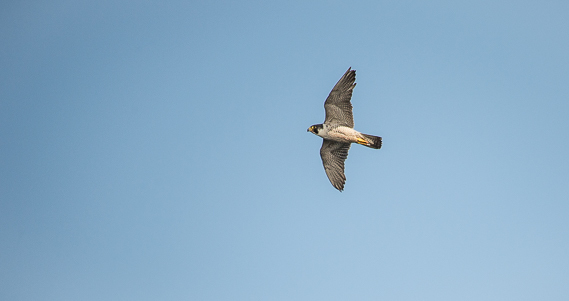 A Peregrine dashed by heading towards the mainland and once again small parties of Kittiwakes and Terns wended their flighty way across our bow. 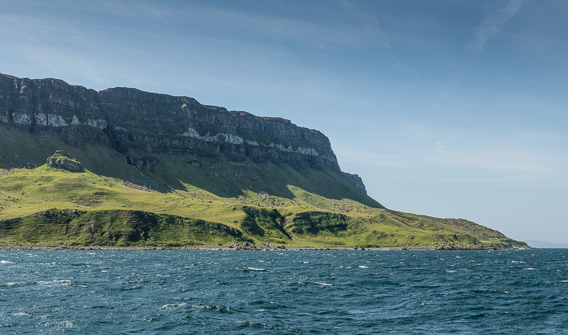 Cleadale cliffs on Eigg, the white band is evidence of a larva flow. Chemical compositions in this band of mugearite rock encourages a different colonisation of lichen which results in the rock appearing lighter. 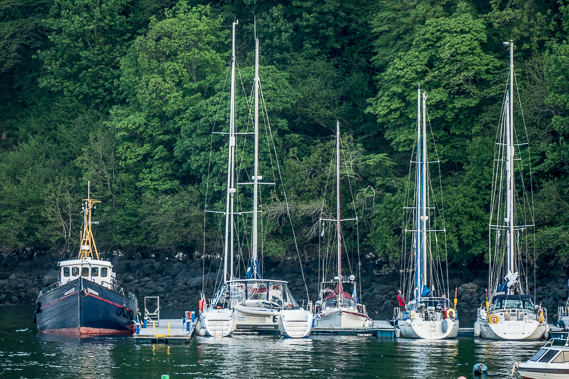 It was gone 7.30pm when we moored up on the pontoons at Tobbermory, the Kylebhan looking solid and now very homely against the super yachts that lay along side. 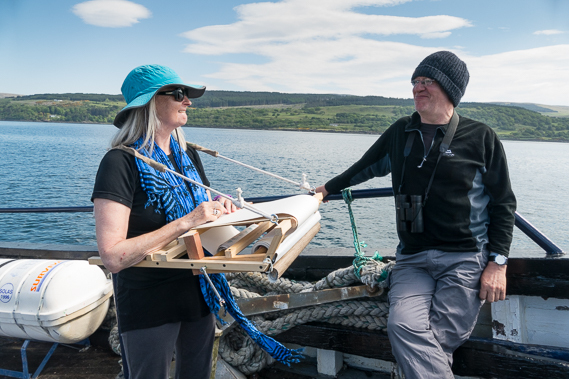 A short sail down the sound in the morning was all we had left, although Gwenda and I had another month in our VW van to look forward to. 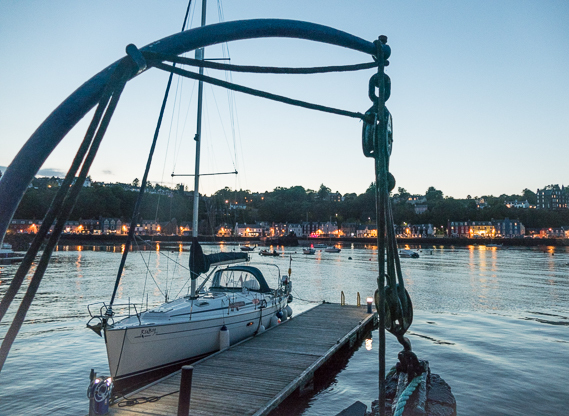 We hadn’t accomplished our dream but we’d seen things and places we would never have had the chance to experience. It had simply been brilliant! Imogen with her ingenius drawing contraption. On more than one occasion we asked what ice cream she had for us! We had all been ‘working’ on this trip. Imogen had been sketching throughout and had a brilliant home made device that allowed her to freely sketch whilst walking or travelling through the landscape. With a turn of a wheel cogs began to roll the paper through, thereby creating a linear series of sketches that acknowledged time. Steve was filming throughout and making recordings on his Zoom H1, the same recorder I was using to record a diary at the end of each day. 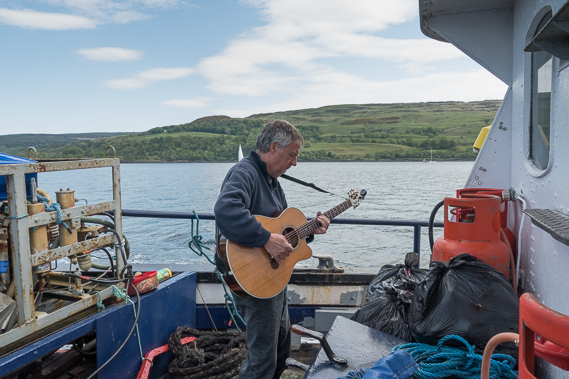 He was also recording new responses to the land and seascape on his guitar. 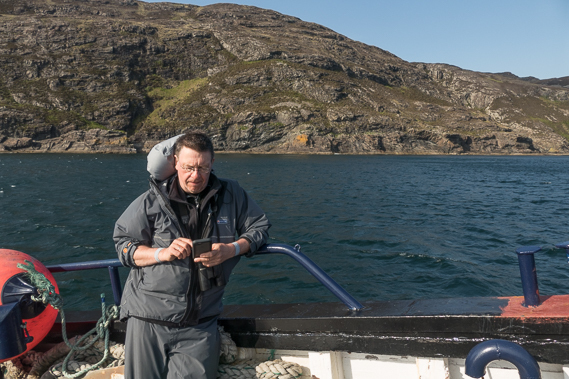 Mike was using his iPhone camera and composing images with vast skies and posting them whenever signal allowed. 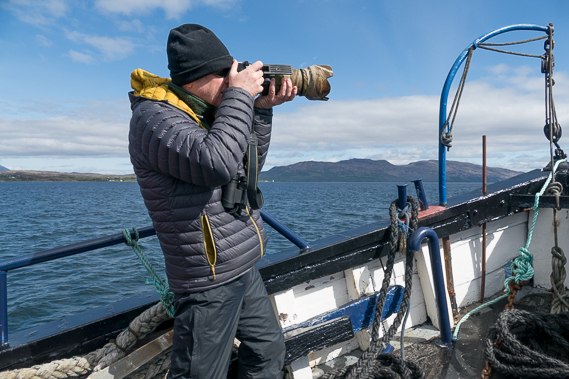 He was also absorbing every moment and recording the flowers we had seen on our brief walks on the islands. 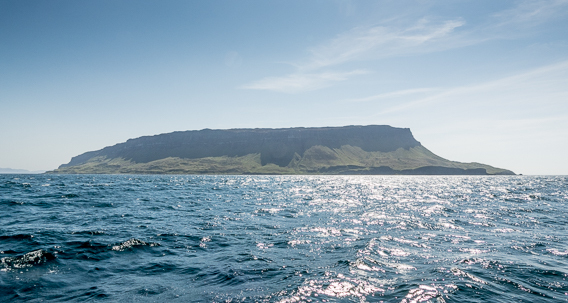 We will all reconvene in the autumn to see what we produced on the trip and how we have subsequently responded to our time around the islands. 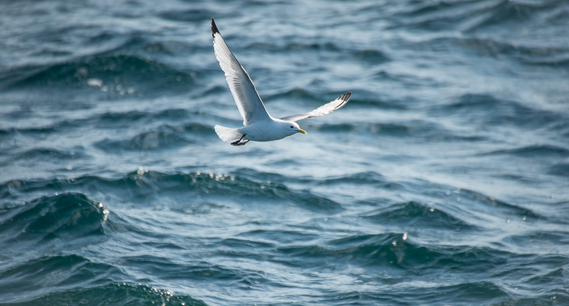 In many ways a trip like this is never over, it holds in the memory so vividly and feeds your very being long after you have debarked for the last time.